The Happiest Day in the Life of Olli Mäki, a film based on the life of a legendary Finnish boxer, came out swinging in a bout with the big boys and girls in Cannes. Its win of the Un Certain Regard award there came as no surprise to anybody who saw this engaging and visually striking first feature by Juho Kuosmanen. 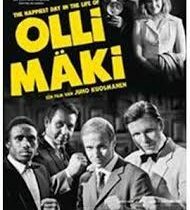 It’s the summer of 1962, and Olli Mäki has a shot at the world championship title in featherweight boxing. He’s prepping for the big fight against the ruling world champion, American Davey Moore. Olli’s hard-nosed and ambitious trainer Elis (a Finnish Harrison Ford) pushes him to reach his fighting weight, and ferries him around to photo shoots, sponsor dinners, and other swanky publicity opportunities amid the bright lights of Helsinki. Olli has a chance at being Finland’s golden boy, of hitting the really big time – if only he’d focus. But there are a couple of problems. Olli is a Communist baker from rural Finland, and he chafes under the pressure to become a star in this American-style show business machine. He’s a reluctant working-class hero. But the biggest problem – at least from Elis’s point of view – is that Olli has fallen in love. Olli’s lady fair Raija is played by charming newcomer Oona Airola, and it’s perfectly easy to see why Olli would fall for her. She’s a hometown girl, easy and natural, in contrast to the icy, fur-clad blondes of Helsinki. Olli and Raija have a friendly and forthright relationship that reinforces Olli’s ideas about the important things in life. And now that he’s found her, he can’t concentrate on anything else, like training for the match. The film is warm and funny, as Elis and the publicity hotshots thrust poor Olli into some hilarious situations in the run-up to the big fight. Shot in gorgeous 16 mm, the film hearkens back to 1960s cinema vérité classics. Its splendid opening traveling shot provides a stylish nod to Jim Jarmusch, or maybe director Juho Kuosmane’s fellow Finn, Aki Kaurismäki. Olli Maki reminds us how important it is to forge your own path to happiness, regardless of outside expectations. You just need to keep your eye on your personal prize, and roll with the punches.